In The Broken University, education expert James Stanfield examines what is seen and what is not seen in the UK higher education sector. In contrast to the conventional wisdom, he finds no compelling evidence to suggest that public subsidies to higher education have any economic benefit. Moreover, Stanfield convincingly argues that once its hidden costs and unintended consequences are taken into account, government intervention in higher education is doing far more harm than good, and is holding back the development of one of the UK’s most important service sectors. Mr Stanfield’s report also criticises research council funding, highlighting costly projects that it considers to have been a waste of money. It adds that the lack of a profit motive in higher education has had a negative effect on the qualifications universities provide. “Without government intervention, there would now be a variety of different, competing private qualifications providing a variety of educational experiences – many of which would have more purpose and relevance to an individual’s future career than a degree,” it says. It recommends abolishing the cap on fees, allowing “full freedom of entry” into university, and extending tax benefits to for-profit institutions. Steve Smith, president of UUK, responded that higher education provided an “outstanding return” on public investment. “For every 61p of public investment received, universities also lever out 39p of private and international investment,” he said. “Compared with other sectors, this represents an excellent return. Universities now generate £59 billion a year for the UK economy, £15 billion more than in 2004.” He added that the sector achieved this despite receiving lower levels of public and private funding than competitor countries. The proposals don’t seem to have garnered a huge amount of support to date. It might have something to do with the fact that the argument that public funding does more harm than good is rather a difficult one to sustain. 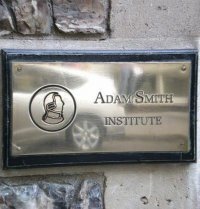 This entry was posted in economics, Education, fees, Government, HE, Students, teaching and learning, University and tagged Accountability, Adam Smith Institute, fees, funding, HE, HEFCE, research, Students, teaching and learning, universities by Paul. Bookmark the permalink.